We're looking for artisans and artists who would like to sell their products in our store. Wew ant to support norther made products. Once again Northwestel is calling on Northern artists to apply and have their artwork considered for one of Northwestel's three 2017/2018 telephone directories in Yukon & Northern BC, Northwest Territories and Nunavut. Three artists and their artwork will be selected for the directory covers and winning artists will each be awarded $3,000. 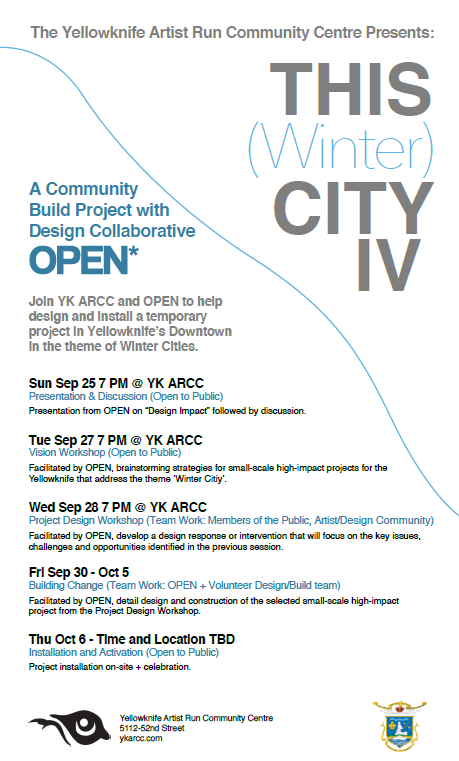 Join YK ARCC and OPEN to help design and install a temporary project in Yellowknife’s Downtown in the theme of Winter Cities. Presentation from OPEN on “Design Impact” followed by discussion. The City of Yellowknife Heritage Committee, in partnership with the Yellowknife Artist Run Community Centre (YKARCC), is hosting a juried art show. This year, the Heritage Committee chose "Performance" as the theme for its 2016 activities. Yellowknife's multi-faceted history is often reflected in the artwork, music and theater performances that enrich the lives of Yellowknifers on a daily basis. The Heritage Committee Art Show will be on public display from November 14 to 19 at YKARCC's gallery space located at 5112 - 52 Street. Sept 10: Jim Byrnes and the Sojourners in the Northern Arts and Cultural Centre YellowknifYellowknife. The 12th volume of "International Comtemporary Artists" is in progress and submissions are being accepted for inclusion. A juried committee will be selecting the comptemporary artists to be featured in the book. Artists can apply and by sending 4 -5 sample images of their work in JPG format by email and a short statement or eassay, no more than 100 words. If an artist's work is selected it will be presented in the book in an one-page layout containing images of the artist work, the essay or statement with contact information. Yellowknife Artist Run Community Centre (YK ARCC) is accepting submissions from artists with an interest in developing a site-specific project for the annual Snow Castle. We are looking for projects that examine and explore themes connected to the Winter Festival itself and/or the surrounding landscape of Great Slave Lake and Yellowknife Bay. Join Joanna P McMann of Black and White Bindery on an exploration of non-adhesive bookbindings. Participants will create a selection of soft-cover book models that rely on various sewing techniques, rather than paste, to hold them together. No experience necessary. All tools and materials will be provided. Parents can also register with their children. Painting is a beautiful way to express yourself and to deepen your appreciation for your surroundings. Call for photographers to carry out photo-portraits sessions for the community of Yellowknife NWT. As part of its artistic project "Mosaic NWT", the Association Franco-Culturelle De Yellowknife (AFCY) seeks professional and amateur photographers. The project aims to create a Nordic themed mosaic, in which photographic portraits will be included in a paint-by-numbers painting created by a local artist. An opening will take place in March 2017, during a day dedicated to Francophonie. Applications for this funding program are currently open, and they are trying to reach out to areas of Canada that have not historically been represented quite as well in their programs—so they are hoping to spread the word about this program to writers, poets, and event organizers that could potentially benefit. Deadline is July 31, 2016. 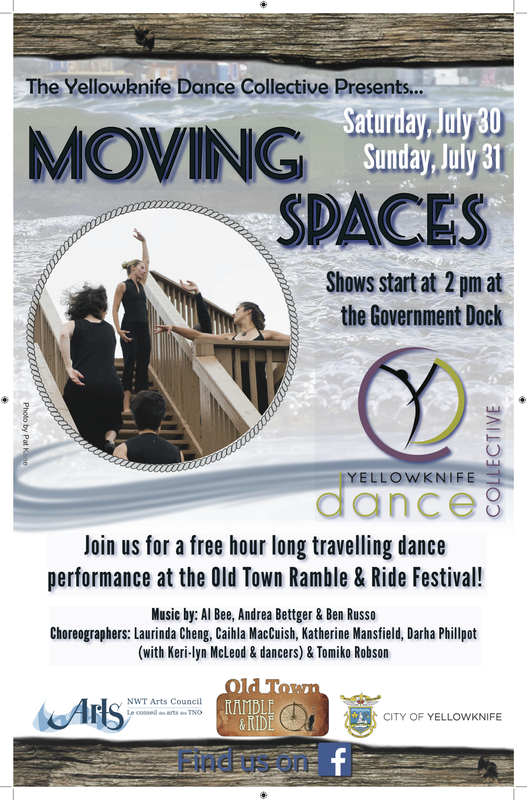 Yellowknife Dance Collective (YDC) will be presenting Moving Spaces, a site specific dance show at the 2016 Old Town Ramble and Ride festival. The Yellowknives Dene First Nations (YKDFN) Community Wellness offers a variety of programs. Activities happening in July. The Ndilo Summer Program is designed for ages 11 yrs and up. The Yellowknife Artist Run Community Centre (YK ARCC) has a new location in downtown Yellowknife. Located at the lower level of Cloudworks One, 5112-52nd St (the old Union of Northern Workers building), YK ARCC has an artist studio and large gallery or workshop space available for use by local and visiting artists. The Prince of Wales Northern Heritage Centre has a variety of traveling exhibits to share with your community. These exhibits were developed by the Prince of Wales Northern Heritage Centre to allow community residents access to the collections and resources of the Heritage Centre. Currently there are ten (10) traveling exhibits available for NWT communities from September 2016 until June 2017. A brief description of the exhibits is enclosed. Disciplines: Activism, Art Education, Collaboration, Community, Conceptual Gardening Theory, Crafts & Trades, Curatorial, Design, Experimental, Film & Video, Installation, Media Arts, Music & Sound, Other, Performance, Photography, Printmaking, Sculpture, Visual Arts. Duration: 2 weeks. Programming late-September to early October 2016. Somba K’e, Denendeh — Dene Nahjo invites the public to experience the revitalization of an ancient cultural practice through the teachings of Elders during a three-week caribou and moose hide tanning camp at Somba K’e Civic Plaza (Yellowknife Tennis Courts) this summer, July 11-29, 2016 Monday – Friday.